Want to leave behind a message at home when your middle-schooler returns from soccer practice? Stick-it notes require you to be short and crisp – probably something that could work for an adult-to-adult message. What about when what you have to convey involves an evening snack in the refrigerator, a reminder to fasten all doors and windows as well as to not entertain strangers, and various other cues that you might want to include? Added to that, you are in a hurry! How easy would a recorder be at such a moment? How about something user-friendly as well as kid-friendly? Enter Green Monster Talkatoo. A funky pendant that you clip on to a keychain, a chain, backpacks, lunch boxes, or even the loops of your belt. It acts as a voice recorder that can be used to tape reminders or leaving simple messages such as an ‘I miss you’ or any thirty second vocal piece that you find important! Perfect for kids, teens, and even adults who are young at heart. Just press the little button, speak whatever you like, record- and tada! The message can be replayed as many times as the person would like to hear and for as long as the battery lasts. The Green Monster Talkatoo flaunts certain other features that cater so well to the exact needs of the customer. 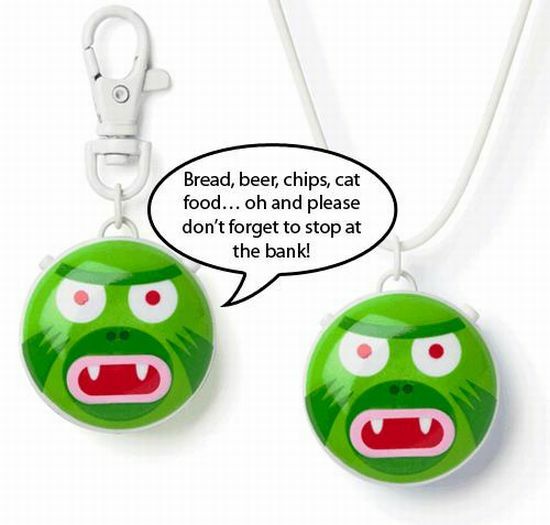 The charm pendant is a round-shaped face of a green monster that has a high gloss finish on both sides that is not only sleek but also resistant to scratches. Mainly, the recorder provides clarity in tape-recording the message and can be used to re-record unlimited number of times. It runs on replaceable button cell battery ensuring a long life without worries about recharging while operating. Perhaps the most thought feature is that of the lock facility, saves the message from being disturbed while movement or random rubbing it. When reviewing this useful product, it is hard to ignore the user-friendly nature of the Green Monster Talkatoo. It is simple as well as a considered one-step recording interface with a decent taping time. Available at $16.99.Perfect as a gift to your child or a friend you treasure. Just record a message saying how much you care about them and all that they mean to you. He or she can play it over and over in your absence just to feel good and hear your voice. Green Monster Talkatoo. Monstrously useful. If you think this to be interesting, make sure you also check out Silver Space Invaders Pendant and Keychain Sized GPS Homing Device.